The main component in the material — Nickel, its share ranges from 65% to 71%. Chrome, contains in the range of 26−29%. The share of impurities accounted for about four percent. The alloy is produced in open induction furnace or with the application of electro-slag remelting. It is heat resisting and high alloy alloy. 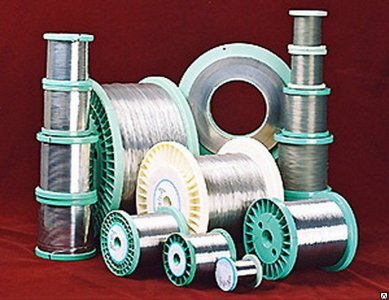 Due to the high content of Nickel and impurities of silicon and aluminum, the wire has a high heat resistance. Due to the oxide film on the surface, the wire is not destroyed in the gas environment. — fastening elements, operating at temperatures up to 800 °C. Supply of wire from alloy KHN70JU — 2.4872 is: wholesale and retail, bays or coils. Wire brand KHN70JU — 2.4872 from the vendor Electrocentury-steel can be supplied annealed or nagarebana. To by wire Khn70ju — 2.4872 from the vendor Electrocentury-steel can wholesale or retail. On the website reflected the price and mix of products to date. All products are certified and meet the highest standards. Excellent product quality and reasonable price — the face of the company Electrocentury-steel. Regular customers can buy the wire, using the the discount discount system. Delivery is carried out from warehouses located in Russia and Ukraine.